April 28, 2017 April 28, 2017 by Beau H.
Welcome to another weekly #menswear recap, whereby we’re looking back at some choice reads you should tick through this weekend. How was your week? It was a busy one in the Brooklyn “office” of The Style Guide, what with a PR client event via my day job on Wednesday night at the luxurious Beekman Hotel and a plethora of blogging in between. It’s a tough, sometimes sleep-deprived gig, but someone’s gotta do it! And in that regard, I sure am glad it’s the weekend. If you’re setting out on a spring adventure, here’s the weekender bag you need to buy now. And if you could use some help organizing the rest of your gear, feast your eyes upon stylish dopp kits for spring travel. Oh, and if your weekend per chance calls for an early spring wedding? Wear any one of my picks for stylish men’s dress shoes to shop now. In the meantime, we’ve got a few more items for your perusal below — it’s quite tough to believe we’re nearly into May and staring down summer. I, for one, cannot wait for music festival season and a bit of summer travel. But for now, I think I’ll look toward Friday happy hour, some light reading and enjoyable spring weather. Join me, won’t ya? See you tomorrow for our Style Pick of the Week, and you can catch some of my style pursuits in the meantime on Instagram. Lastly — thanks for reading! I know I’ve been struck by the talent and deep, brooding and well, terrifying nature of some of Javier Bardem’s on-screen characters. Esquire continues to prove why they’re the best around when it comes to engaging and insightful profiles, and I’d urge you to check out their profile on Javier Bardem from this month’s print issue. Better yet, get out there and buy a copy. Want a light spring jacket or a pair of breezy trousers made with substantial, yet pliable, cotton fabric? Want them done up in one of a few beautiful shades of blue? That’s where the men’s and women’s style purveyors at 13 Bonaparte come into play. The French brand makes carefully crafted, refreshingly easygoing pieces fit for spring layering, from workwear shirt-jackets to band-collar shirts and unique, lightweight cotton trousers. The pieces are interchangeable via the brand’s numbered collection system (so, numbers 1-9, for example). The brand also releases two core collections a year, but it was the cool-looking denim shirt-jackets that caught my eye during a recent tour of the collection with Founder and Artistic Director David Sarfati. In all, it’s a continental take on pieces you already know — and only through this weekend, you can find them in NYC! Venture on down to 2 Rivington Street through Sunday to get a look at the brand yourself, and shop the 13 Bonaparte site for more. 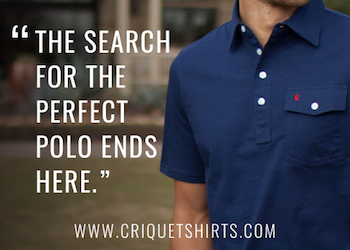 A lightweight spring henley is both specific and yet oddly tough to find, from time to time. I recently wrote about the Flint and Tinder Slub Henley and why you should buy it — and I’m here to tell you again: Buy it, layer it, wear it on its own… when those breezy spring and summer beach nights come along, you won’t regret it. And if you need an idea of just how to style it, take a look at our recent feature on how to upgrade your henley this season. Looking for a new addition to your everyday carry? It would behoove you to check out the excellent, tech-minded Cross Pens Peerless TrackR Pen. This ballpoint pen blends a pleasing weight and nice writing ability with the sort of technology more common to a Bond film. It syncs up with an app that tracks its location at all times — not too shabby. And it’d be a great Father’s Day gift — if you’re shopping around early, that is. Last but certainly not least …. It seems to me that patio drinking season is in full force — at least, judging by the crowds around Brooklyn. Given that, I’d wager you’ll need some stylish bar crawl. And so I give you two guides: my 2016 guide to how to dress for a spring bar crawl, and my most recent bar crawl style guide for The Manual. Have a good one out there! April 26, 2017 April 20, 2017 by Beau H.
From dressing for a spring road trip to prepping for today’s style suggestion — gearing up for Sunday brunch — there are plenty of #menswear matters that require your full attention this season. So, listen up! Just kidding. We’ll keep it light and casual today –just as you should when putting together an ensemble for a casual late morning or early afternoon meal. Certainly, not everyone is a brunch fan — but count me in the pro-brunch camp, through and through. We talked last year about how to dress for your next Sunday brunch, but seeing as there are plenty of brunches in your future, it’s high time we updated the look — right? Given that knocking back a Bloody Mary or two comes at a cost — Saturday night festivities — it’s crucial to still look put-together while remaining comfortable and casual. With that being said, we’re mixing stylish Apolis slim chinos and a classic denim shirt with other versatile daily style staples — like an investment-worthy leather watch — that you should already have in your closet. Ultimately, keep it simple and keep it fun. Oh, and put a Bloody Mary on my tab — will ya? For style inspiration on the go you can hang with me on Twitter or Instagram, if you please. A nice way to switch up your rotation of Oxford shirts. If you want to switch things up from a classic Oxford, there’s perhaps no better way to do it than a just-different-enough Western shirt. JACHS does excellent work when it comes to quality fabrics (all sourced by the brand), and the faded wash on this rugged denim shirt makes it an A-plus style move. Unique design details like the snap buttons and Western stitching round things out nicely for your next brunch outing. A neat base layer that provides a dose of comfort and style. Flint and Tinder calls its Supima Air Knit Long-Sleeve Tee the “cashmere of cotton” that should be lightweight, breathable and nice for layering. While you could also layer a rugged henley under your denim shirt, a knit long-sleeve tee in a color like burgundy adds visual interest and provides another layer in case it gets breezy. And as with all Flint and Tinder gear, you’re getting quality style and great looks for your money. A classic pair of chinos fit for a long Sunday brunch. Way back in 2015, this site sang the praises of Apolis slim chinos, and we’re back for round two today. The brand works its magic using a mix of classic style, sustainability and ethical practices. For starters, the modern cut should be more than agreeable for bunch. Throw in the fact that these chinos are made responsibly in Peru, and the company’s Certified B Corporation status only adds to the brand’s significant style chops. Yessir, buy these and pair them with spring style essentials aplenty. A comfortable, easy-to-wear and well-made suede chukka. Want to casually and comfortable offset those slim chinos? Pick up some suede chukka boots from yet another brand that makes its gear with sustainability and serious style in mind — that would be Astoflex, folks. The brand’s suede chukkas are ridiculously comfortable and made with top-quality suede that ages well, for one. And the casual open lacing of these chukkas is a nice way to look put-together without having to break out stylish dress shoes (although you could do that, too). So kick back and order another one, maybe? Lighter fabric and a distinctive pattern make these socks suitable for spring brunch. If you thought houndstooth as a pattern only worked in the colder climes of fall and winter, think again. Our pals over at American Trench have taken the distinctive pattern and applied it to a nice range of versatile, spring and summer-friendly socks. They’re pricey, that much is true, but from personal experience … they could just be the most comfortable pair of socks you own. A watch that blends vintage style details with a dressy design? Perfect for brunch. Stark is perhaps the wrong name for this Farer watch — because it’s handsome and slightly rugged, yet refined … all at once. Sold via the good folks of Huckberry— as most great gear tends to be — it combines the utility of a chronograph with the distinctive look of a vintage watch your grandpa might have worn. Named after legendary British travel writer and adventurer Dame Freya Stark, it does indeed blend vintage styling details, such as the curved hands, with a dressy 39.5mm diameter. In short, the Farer Stark Watch absolutely belongs in your casual watch collection. Add some fabric and color to your belt game with La Matera — it’ll upgrade your accessories game significantly. Because you should leave no stone unturned in the way of style upgrades, a nicely designed belt with cool detailing is the way to go. It’s not every day that a belt blends both full-grain cognac leather and fabric from Argentina woven on vintage looms, but then again, not every belt is the La Matera Corbina Belt. With that unique fabric and its beautiful design, it’s an easy way to add some subtle flash to this Sunday brunch ensemble. It might seem counterintuitive to spend a little money on something designed to … hold onto your money. But then again — no one wants a Costanza wallet situation, right? Speaking from personal experience, the slim Andar Scout Wallet goes with me everywhere and slides right into my front pocket, my back pocket, my blazer pocket — you name it. The leather will age nicely and look great, too. After all, you’re picking up the check at brunch — yeah? Dressing for Sunday brunch and adventures thereafter doesn’t have to involve anything too complicated — veering ever-so-slightly away from the basics (like swapping a denim shirt for a classic Oxford) is a good place to start. Adding in stylish complements helps even things out, too– enter the Flint and Tinder Supima Air Knit Long-Sleeve Tee. And offsetting that visually interesting combo is made easy thanks to classic, easygoing Apolis slim chinos and accessories like the vintage-inspired Farer Stark Watch. Don’t forget those finishing touches — the La Matera Corbina Belt is a good one to pick up, to say the least. With all that in your closet, the hardest part now is just picking out somewhere to go — Brunch Village, anyone? Good luck and don’t eat the Pop-Tarts. April 25, 2017 April 20, 2017 by Beau H.
Morning (or afternoon … or evening), folks! Thanks for being with us as we talk how to upgrade your pocket tee this spring. In the men’s style world, never underestimate the importance and utility of a great-fitting T-shirt — especially one that you can wear in a way that’s slightly different from other spring style moves. Once you figure what size works for you, you can use said T-shirt to take on the world in style — particularly as the thermostat climbs. And if you want to switch up your T-shirt game, take a good, hard look at the humble pocket tee. Unlike a standard white tee, it’s got more going for it in terms of versatility and visually interesting looks — the chest pocket draws attention to, well, your chest, for starters. It’s the small details that make a stylish pocket tee suitable to wear on its own or layered up — as you’ll see in today’s #OOTD. We’re mixing a bit of a mononchromatic color palette with a statement-making tee, classic spring sneakers and all of the stylish everyday carry pieces you can get your hands on. It’s the sort of #OOTD you can reliably wear on a weekend coffee date or a spring bar crawl …. or both. What’d ya say? Let’s go to it. For style inspiration all 365 days of the year, follow along on Instagram. A unique take on the pocket tee, accented with classic, spring-friendly style essentials. The Pocket Tee: Richer Poorer Crew Pocket Tee in Pink, $32 — Think pink isn’t a color that’s made for you? Think again. We’re seeing a lot more of this dusty pink shade across menswear and women’s style, and using it as your base is a significant style upgrade. The Shirt: Abercrombie and Fitch Two-Pocket Chambray Shirt, $35 — Why are we layering up our pocket tee with a stylish chambray shirt? For one, it’ll help combat any spring and summer breezes. And, number two: If you’re wary of the pink T-shirt, it takes some of the focus of it. Plus, a chambray shirt is a rugged essential for the entire year. The Denim: Abercombie and Fitch Super Skinny Denim in Light Wash, $59 — Here’s where that monochromatic style we talked about earlier comes into play. This pair of stretch denim blends retro style with comfort — feel free to wear them to your next rock concert, too. The Sneakers: SeaVees Hermosa Regatta Sneaker, $88 — We here at The Style Guide absolutely love what’s being done by SeaVees across the board — the Hermosa Regatta Sneaker blends a unique spring color with a light weight and quite a lot of comfort and style. The Socks: Darn Tough No Show Ultra-Light Cushion Socks, $29.98 — If you’re going to break out classic SeaVees sneakers, some no-show socks are in order — yes? Darn Tough makes some of the best around. Pricey, but comfortable and much-needed. 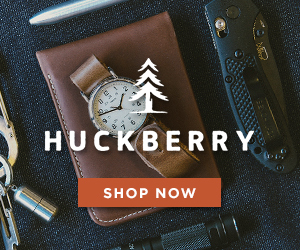 The Watch: Huckberry Combat B33 GMT Watch, $498.98 — We’ve waxed poetic about the durability and style of the rugged Huckberry Combat B33 GMT Watch, and its simple design makes it ideal for pairing with laidback pieces. The Sunglasses: Sunski Madronas Sunglasses, $55 — Every so often, you want shades that are simple, stylish and affordable — that’s where the Sunski Madronas sunglasses come in very handy indeed. Yes indeed, these are definitely worth adding to any list of the best men’s sunglasses. The Ballcap: Huckberry Explorer’s Cap, $39.98 — To keep the sun off your face during interminable hours sipping patio beers, reach for the vintage-inspired, well-made Huckberry Explorer’s Cap. Looking through the above #OOTD has me positively dreaming of cracking open a cold one on a patio somewhere — hopefully, you’re in the same boat. The key to this outfit revolves around the unexpected pink shade of the pocket tee, plus visually interesting layering via a classic light chambray shirt and slim light wash denim. Of course, it wouldn’t be an #OOTD without stylish spring sneakers — that’s where the Hermosa Regatta Sneaker has you covered. And in that regard, you’re going to need a tough casual watch to take on spring excursions — that’s what the Huckberry Combat B33 GMT Watch can do for ya. And it’s with two personal favorites of mine that we close out this outfit — there might not be a more stylish ballcap out there than the Huckberry Explorer’s Cap, and for classic, functional spring style, it’s tough to get better than those Sunski Madronas shades. Would you wear your pocket tee in a similar fashion? Leave any feedback over on The Style Guide Facebook page, and join us tomorrow for a new Online Shopping Picks entry. April 24, 2017 May 24, 2017 by Beau H.
Just hanging around in Brooklyn waiting for the Chairlift show. Denim Jacket by Forever21. Graham Shirt by Mott and Bow. Super Skinny Skinny Jeans in Light Wash by Abercrombie & Fitch. Service Boots by Viberg. Military Watch by Timex x Todd Snyder. Flight Brief by Owen and Fred. Glasses by Frameri. It was with great excitement that I sat down to write this post — after all, this past weekend combined some of my favorite things (certainly, the chance to make AC/DC references in headlines is among them). But on another note, if you follow along with yours truly at The Style Guide, you might have an inkling as to a few of my favorite things. In short order: Live music, #menswear and Brooklyn explorations. Luckily for me, all three were on the docket this weekend. And as you might have read in past travel feature posts, there’s nothing I love more than dressing for a rock concert, hitting up a choice brunch spot, and enjoying an excellent show. It was a momentous weekend for all those reasons –namely, it was my first chance to check out the newly opened Brooklyn Steel, now the largest music venue in the borough. Of course, I hit up a few great coffee shops — and unlike my recent road trip to Pittsburgh, I didn’t even have to lug around a rugged weekender bag! Join for me the ride and see how I took on the weekend in style. Mixing high-low style with the Life/After/Denim Patchwork Shirt, the standout Standard Issue Utility Chino from Apolis and the handsome Allen Edmonds Liverpool Chelsea Boots. Leatherback Writer by This Is Ground. Pen by Cross Pens. Watch by MVMT Watches. Sunglasses by Tom Ford. The weekend really kicked off properly on Friday, what with the chance to break out a bit of festive spring style for time on the clock at my day job in fashion PR. The real highlight though? It has to be Life/After/Denim Patchwork Shirt, an entirely unique piece that’s fit for the office and fit for a Friday evening. Seeing as I spent mine both taking care of business at work and shooting a few photos with Megan Collins of Style Girlfriend (new project coming soon! ), this piece worked out perfectly for both pursuits. And it proved a breezy complement to my durable, classic and versatile Apolis Standard Issue Utility Chinos — the neutral color and clean fit played perfectly off what are quickly becoming my new favorite boots: the Allen Edmonds Liverpool Chelsea Boot, which merge a sharp silhouette with beautiful brown suede. Useful everyday carry pieces like my This Is Ground Leatherback Writer and a crisp, classic MVMT Watches brown leather watch proved essential, too. More importantly: If you seek a subtly stylish pen made for daily use, the Peerless TrackR Ballpoint Pen is seemingly immune to being misplaced thanks to a built-in locator app. It writes quite nicely and looks great, too. So, those were the essentials I used to take on a last day of work — but what about the rest of the weekend, ehh? For Chairlift’s final NYC, I had to break out my Abercrombie & Fitch Super Skinny Denim tough Viberg Service Boots and grooming gear from Oars + Alps. 1951 Traveller Bag by Graf Lantz. Saturday brought with it the promise of a brooding-yet-bright, eclectic and plain fun synthpop show from Brooklyn duo Chairlift — the group’s last-ever NYC show — plus the chance to get out and explore Brooklyn with my favorite men’s style gear in tow. The breezy and temperate spring day proved the ideal chance to break out my new favorite spring shirt: The soft, slim and well-made Mott and Bow Graham Shirt, with a light blue shade that’s a great change of pace from more traditional chambray shirts — truly, a nice way to offset my Forever21 Denim Jacket. The shirt was one part of a monochromatic look alongside a slim pair of Abercrombie & Fitch Super Skinny Denim — the light wash calls to mind the ’90s quite nicely, and fit right in at Saturday’s show. Equally perfect for the occasion? My durable, tough and essential Viberg Service Boots — an incredibly well-made, distinguished pair of boots that I’ve already begun breaking in around Brooklyn. They’re quite simply the nicest pair of boots I’ve ever owned. And coming from a guy who loves tough leather boots … that’s saying something. For a day that took me around Williamsburg, I loaded up my new, sustainably made and very effective Graf Lantz 1951 Carrier Bag. Made with biodegradable 100 percent merino wool felt in a rich shade of green, this is one bag that carries enough clout and style to be used every day. I supplemented my everyday haul with the essential Timex x Todd Snyder Military Watch and the This Is Ground Leatherback Writer — both well-priced favorites critical for any writer. And crucially, I had to prep for the day ahead with new grooming gear from Oars + Alps. The Active Armor Deodorant is a winner — it’s effective and made with a crisp scent. While my gear helped me navigate the borough, there are a few other key ingredients that helped considerably. Namely, a caffeine pit stop at my favorite coffee and menswear shop in Brooklyn, Upstate Stock, plus a delicious pastrami sandwich at coffee shop The West and a trip for craft brews at Beer Street in advance of Saturday evening’s Brooklyn Steel show. And as to the show itself: A winner all-around, to say the least. As you might have expected from my winter trip to New Haven and my December trip to see The Head and the Heart in Baltimore, it’s very tough to top the excitement and buzz around checking out a new venue. In just its second full week of action, Brooklyn Steel — housed in a former steel fabrication shop and jammed with a crowd of 1,800 — didn’t disappoint. Critically, neither did Chairlift. They’re perhaps most well-known for their hit song “Bruises,” of Apple commercial fame, but there’s more to it. The duo of Caroline Polachek and Patrick Wimberly embody making it in the Brooklyn music scene — by way of Colorado — and then sticking around long enough to build a strong local and global following. It’s a testament to the group’s unique sound that even in just three albums, they’ve amassed a deep catalogue. That catalogue includes the band’s 2016 release, “Moth,” which is their strongest yet — both brooding and light thanks to Polachek’s stellar voice, which helped make the evening a great one. It was a a special show, and a long day on my feet, but my Viberg Service Boots are breaking in nicely, and the show was absolutely worth it. Rest assured, Caroline Polachek’s work as a solo artist post-Chairlift will have a big-time fan in this live music enthusiast, and we should all be grateful for the music they’ve left us with. Blending the sporty and the classic. Wenlock Chambray Shirt by United By Blue. Slim Stone Chinos by Taylor Stitch. Sneakers by Gola. Leatherback Writer by This Is Ground. Red Wing Leather Waterbury Chronograph by Timex x Todd Snyder. Sunday brought with it some much-needed relaxation to cap off a busy week — and a busy Saturday. But what would Sunday be without a little great style, ehh? And so, I broke out my slim, essential United By Blue Wenlock Chambray Shirt, featuring a pattern of neat mini-plus signs and a crisp blue color. The Wenlock Chambray Shirt complemented my Taylor Stitch Slim Chino in Light Stone, made in Portugal and featuring the tailored fit one would expect from a brand that prides itself on quality. And Sunday also provided a prime chance to slip into my Gola Classic Comet Plimsoll Trainers, a clean pair of retro-inspired trainers from a classic British brand. The entire ensemble was an effective high-low mix when matched up with everyday carry essentials like my Timex + Todd Snyder Red Wing Leather Chronograph. That timepiece is a hard-wearing watch made for just about anything (including more Williamsburg exploration of choice spots like menswear emporium The Hill-Side). And seemingly as always, my Owen and Fred Flight Brief proved effective at hauling around all the essentials needed for a day of blogging. The right gear for a Sunday in Brooklyn. Wenlock Chambray Shirt by United By Blue. Slim Chinos in Light Stone by Taylor Stitch. Denim jacket by American Apparel. Plimsoll Comet Trainers by Gola. Red Wing Leather Chronograph by Timex x Todd Snyder. Runaway Aviators by MVMT Watches. Flight Brief by Owen and Fred. And the next time you find yourself in Williamsburg, I’d say you’ve got another key stop to make. For one, who can resist an incredible donut …. or fried chicken … or both?? That’s where Pies ‘n’ Thighs comes in. The breakfast and lunch menus are packed with incredibly delicious, indulgent entrees (who wants an Insane Burger, ehh?) and you absolutely can’t pass up their donuts. Like, at all. Indeed, this past weekend really did provide just about everything I could ask for — even though it was a weekend spent at “home” in Brooklyn, home really is a great place to be. I can never pass up a chance to explore the borough, sip on some craft brews and wear my favorite menswear — all while checking out a great show and a venue that’s now very high on my list. It was a special first show at Brooklyn Steel, and I’ll absolutely be back. The fact that I was able to do all of this just by hopping on the subway across a matter of days really is quite unique and one-of-a-kind. So, as long as those subway trips culminate in great adventures, excellent live music and new opportunities, I’ll keep swiping my MetroCard. Until next weekend — and until the next show! April 21, 2017 April 21, 2017 by Beau H.
Ladies and gentlemen, gather round — it’s time for another edition of The Friday Read here on The Style Guide. As we power through April, there are some exciting things on the horizon this spring in NYC. Namely, I’m excited to help host two great work events — both related to #menswear, naturally — in the next two weeks on behalf of Coyne Agency. The work never stops! And yet, we’re churning out plenty of great style-related content here on the blog and via GearMoose and The Manual. Need transitional footwear for spring? I’ve got you covered. Wondering how to dress for a spring road trip? Consider it taken care of. On other fronts, there’s plenty going on, as well — what have you been listening to, namely? The NYC music scene always seems to present new and exciting opportunities and shows around every corner — on that front, you can look for news of an exciting music-related writing venture on the way from yours truly in the coming weeks! In the meantime, start your weekend early with the best men’s style news of the week — and follow along for my weekend adventures over on Instagram and Twitter, 24/7. The mission of Mission Belt — quite literally — revolves around giving back to those in need through micro-loans that help them pursue their dreams. Want a belt that’s more than just a belt? Seriously, you won’t be disappointed with Mission Belt. Crucially, the company makes sleek, essential belts with no holes — just an easy-to-slide adjustable track on the interior of the belt. Add in a range of clean and classic color options and belt combos, and you’re all set — but that’s far from it. The company puts part of each sale toward providing micro-loans for those in need across the world — these loans can go a long way, and often launch small business (such as the story of Mission Belt friend Luis Melendez, who turned an old bus into a mini transportation fleet and a growing business with the help of the company). Still not sold? The company’s belts are affordable, well-made and able to slide on and off easily — that’s the case if you pair ’em with everything from slim light wash denim to olive cargo pants. Need a new pair of stylish spring sneakers in your rotation? Of course you do. And luckily for all of us, Esquire.com recently rounded up the best new spring sneakers. Among that list, the GREATS Royale and Wooster Sand and Perf Pack are particularly sharp and spring-ready. Wear ’em with a white polo and slim light wash denim for spring weekends …. starting right now. So, you need new, stylish swim trunks for summer — right? Well, I’ve got you covered. It was a pleasure and an honor to speak once again with Mr. Todd Snyder for The Manual about the classic, essential Todd Snyder x Birdwell Beach Britches collaboration, featuring retro-inspired swim trunks, a beach towel and even a T-shirt; the fact that it’s all inspired by designs found in the Birdwell archives — and current rotation — is very agreeable and stylish indeed. Speaking of other men’s spring style essentials, I wrote about how to upgrade your casual shirt for spring — that is to say, reaching for a classic blue chambray shirt with moisture-wicking fabric, a slim silhouette and a color that’s unique and spring-friendly. Pair it with a cotton bomber jacket, olive chinos and classic suede chukkas for winning style all season long. Ya dig? A useful, cleanly designed and well-made pen is among perhaps the more underrated everyday carry essentials for us stylish guys and gals — might I recommend the Inventery Mechanical Pen for all your daily writing needs? It’s among my latest offerings for GearMoose. Enjoy! Alright — that’s all she wrote today. Let’s get onto the weekend! You can still expect another Style Pick of the Week tomorrow, and I think you’ll quite like it — just my opinion.